MasterCard will process payments across Russia through the country’s new National Payment System, as Russia is stepping up efforts to make its financial network more independent from the West. Russia’s National Payment System and MasterCard signed an agreement on December 30, the Central Bank of Russia said in a statement on Monday. 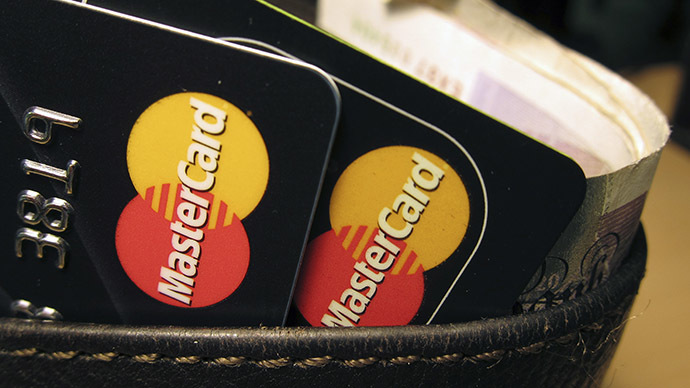 This means MasterCard won’t need to pay a 'safety fee' to Russia’s Central Bank. The bank added that the agreement marks an important step towards implementing the first stage of strategy for creating an operational payment clearing center to process intra-Russian card transactions for international payment operators. Eventually, Russia's Central Bank will become the sole center for settling MasterCard transactions, MasterCard CEO Ajay Banga told TASS in December. Currently, MasterCard and Visa have two settlement centers in Russia – Sberbank and VTB, both of which are state owned. In November, the Central Bank said it would have its own international inter-bank payment system up and running by May 2015. It was designed as an alternative to the global SWIFT network. The new National Payment System aims to ensure uninterrupted servicing which will be immune to geopolitical developments. In March, Visa and MasterCard stopped servicing a number of Russian banks which fell under US sanctions regarding Moscow’s position over the Ukraine crisis. In response, Russian President Vladimir Putin signed a law in May to establish a national payment system. In mid-December, eight Russian banks were connected in a test mode to the card system, which is planned to start operating in March. The system’s developers believe it may appear on the international market as an individual brand in five to seven years.